I used to be a journaling dropout. I would get on a kick to write something every day or would take a challenge to journal during my quiet time every day. Then life would happen and I would miss a day, and another… and frustration would set in as I tried to catch up. And then the notebook would get tucked away so it wasn’t sitting there reminding me how I had failed at journaling. This was all before I discovered that journaling is not about rules and deadlines, but about discovery and learning and remembering. Once I put aside the rigid guidelines I gave myself for journaling, I found myself connecting with God so intimately as I wrote whatever it was that He impressed upon my heart that day. If I missed a day, I missed those quiet moments with pen on paper, but I didn’t find myself feeling guilty or discouraged. Our older two boys have their own private Bible time each morning. They both enjoy writing and drawing very much, so I bought them both notebooks this year to use as their quiet time journals. I had all these “rules” in mind about what they could and could not write in these notebooks, but the morning I was going to give them the journals, God brought to mind my own struggles with the rules of journaling. Visit our friends at Faithgateway to finish reading Erin’s post! 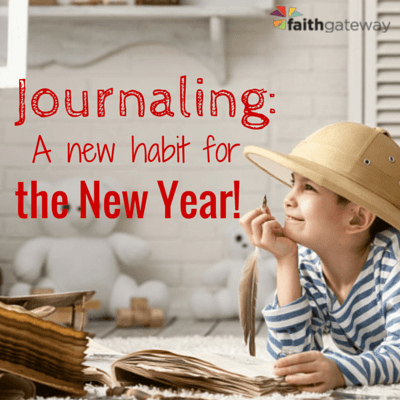 This entry was posted in Blog and tagged Journaling, New Year, quiet time by Hannah Zehring. Bookmark the permalink.